Worbla’s sheet form plastics (Currently Finest Art, TranspArt, Black Art, Mesh Art, FlameRed Art) do not have hard ‘instructions’ the way Worbla’s pellet plastics do, but this page will hopefully give you an understanding of the basic process of how to work with Worbla’s sheet plastics to achieve a variety of effects and results. Working with Finest Art, Black Art, Mesh Art, FlameRed Art. These products activate at 90°C (195°F). Heating can be done with a heat gun or oven. Water is also possible but can be more difficult to control. Once heated, the material will become flexible, malleable, stretchy and adhesive. When cool, they will return to a hard plastic. When activated, these Worbla sheets resemble warm beeswax: detail can be sculpted in but the plastic is resilient enough to avoid ‘squishing’ as you work. 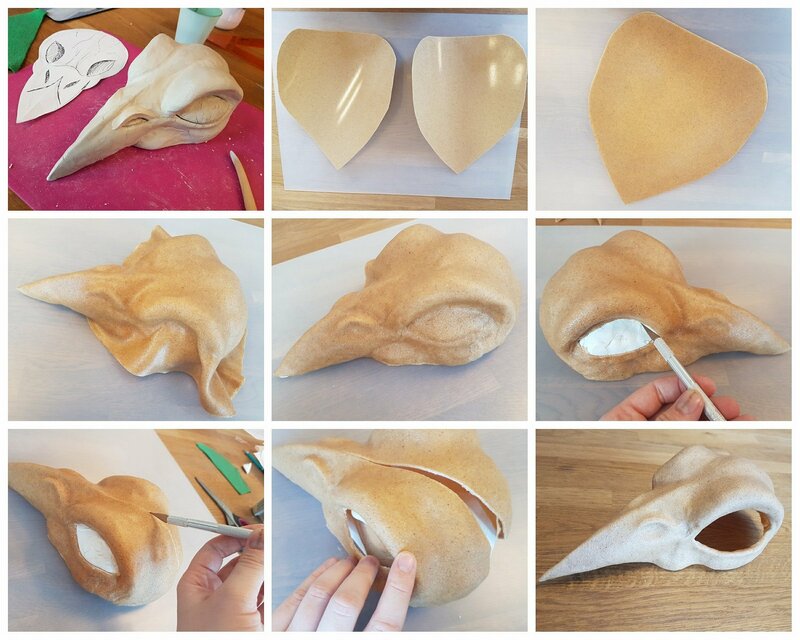 Worbla can be combined to create a putty to sculpt from, or be added to an armature or form. No adhesive is required to attach Worbla to most forms or to itself. These types of Worbla can be reheated endlessly, and will cool in the shape they have been given. 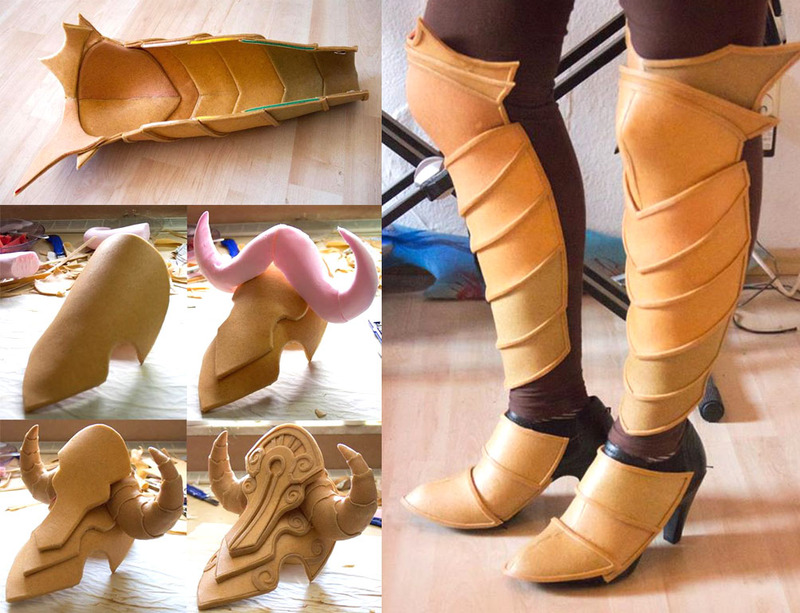 There is no shelf life for Worbla, a project can be worked on endlessly. 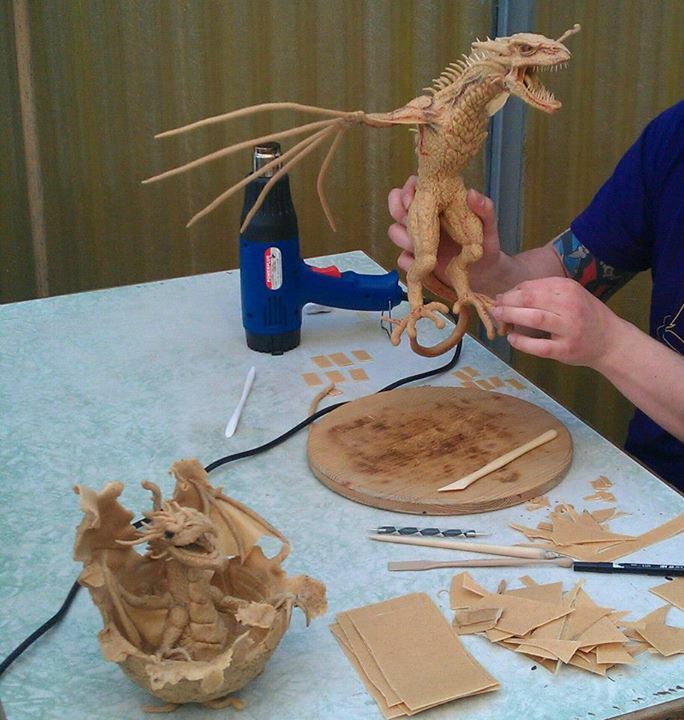 Dragon sculpted from Worbla’s Finest Art by Accessories for the Universe. 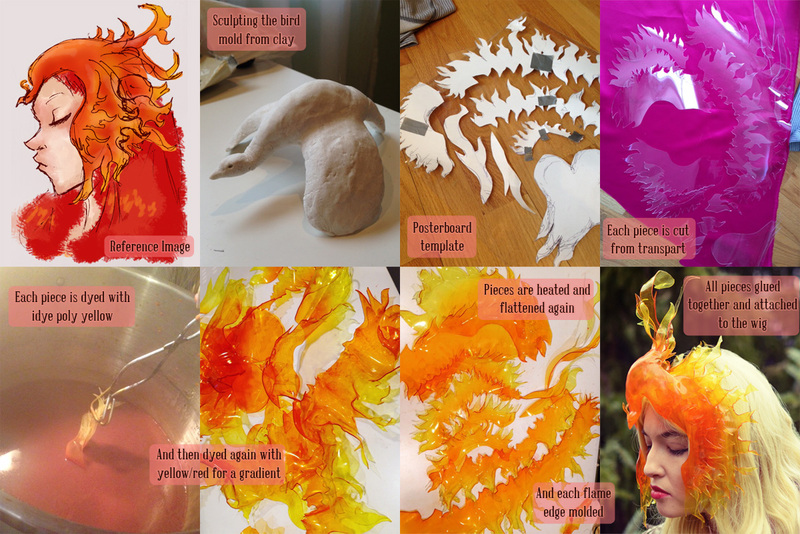 Heated Worbla can be draped over a form and pressed into shape, pushed into a mold, or vacuformed. Complicated shapes may need you to work in sections, avoid undercuts, or have a second pair of hands to achieve a smooth look. A mold release is suggested for most molds to prevent the adhesive in Worbla from sticking. You can see another example of Worbla being cast here. These Worbla products are usually backed with either the fold method or the sandwich method to create flat shapes, to give the plastic body and prevent it from warping while being shaped. This involves creating the shape in flat foam, often in separate pieces, covering the foam in Worbla, and then joining the pieces together to create the final result. Top and right: Worbla sandwiched over foam to create overlapping plates for leg armor. Bottom left: shoulder pauldron made of overlapped sandwiched foam and Worbla’s Finest Art. By Kamui. 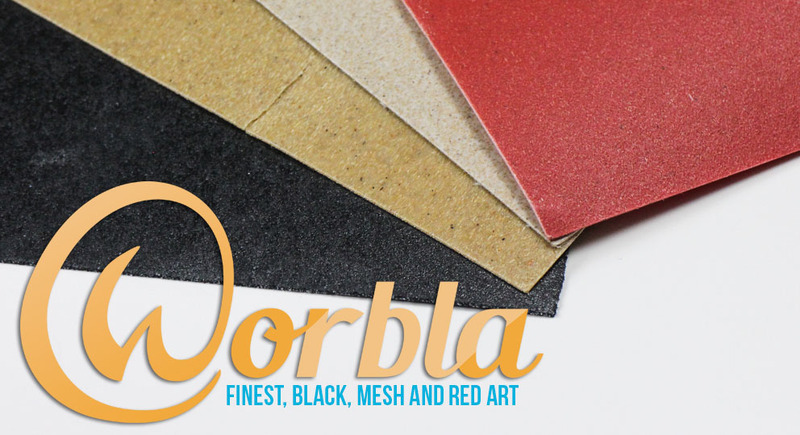 Worbla is often used to cover a structure made of foam, paper, or other lightweight material. Cut a piece of Worbla larger than your shape, heat and wrap. Some darting (removing material) may be needed for very complex shapes, or you may need to work in sections to get a smooth finish. Expanding foam carved into shape and then covered in Worbla for a lightweight prop. By Kamui. Mesh Art is the ‘stickiest’ of the sheet plastics. The mesh structure in it lends strength, but can make molding and sculpting more difficult. Finest Art and FlameRed art are less sticky/adhesive than Mesh Art but still have a strong adhesive property for joining parts. FlameRed has a flame retardant built in and is smoother and will stretch further without tearing. Finest Art has the roughest texture (like an orange peel). Black Art has a smoother texture (close to fine-grit sandpaper) and will tear if stretched. Black Art takes fine detail the best, but is the least adhesive of the group and will require additional heat and pressure for secure joins. You can learn more about each product here. Worbla’s TranspArt (Transpa Art) is currently the most difficult of Worbla products to use, due to the high activation temperature and lack of adhesive. We always suggest researching this product thoroughly before working with it to avoid frustration. TranspArt can be heated by a heat gun or oven, and activates at 120°C (250°F). That is above boiling and as a result heat-resistant gloves are highly suggested to avoid injury or discomfort. TranspArt does not create a ‘putty’ the way that other Worbla plastics do. When activated it is a very flexible, malleable plastic that can be melded: however it must be quite hot and it is easy to overheat and turn the plastic to something closer to hot glue which can stick to your work surface. 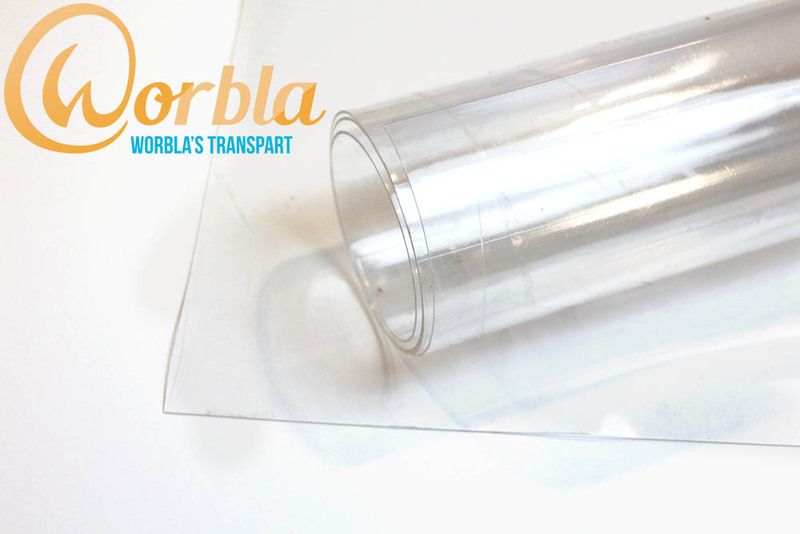 A silicone sheet is highly suggested if you are working with TranspArt, a parchment paper sheet can work as a substitute but your TranspArt may still stick if overheated. When melded into a sculptable form, TranspArt clouds to a more quartz-like appearance. 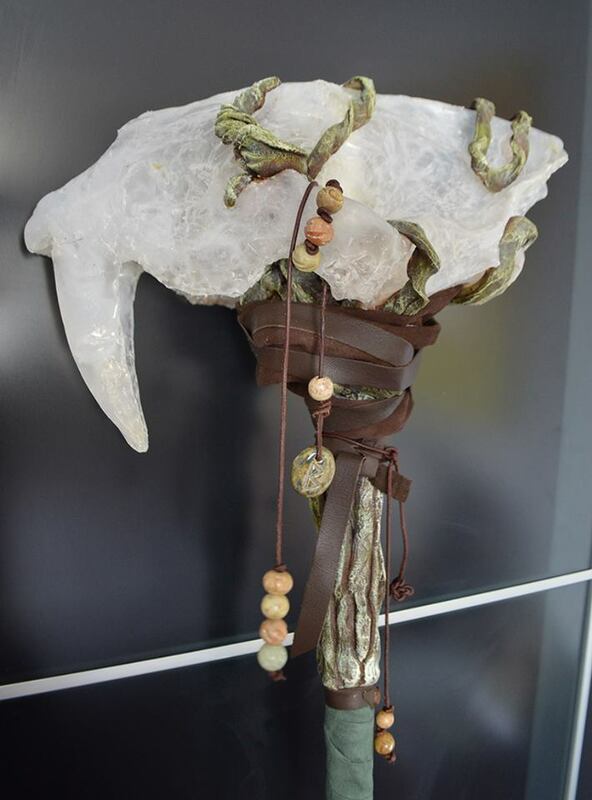 This skull was molded and sculpted by Naruvien Art&Design. TranspArt becomes milky and more crystal-like the more it is worked. TranspArt can be molded over and into most molds, and its excellent flexibility makes it easier to remove from complex shapes. It vacuforms very well, and home made deep draw systems are also easily achieved without damaging the plastic. We have videos of various vacuform methods for TranspArt here. TranspArt does not adhere to itself and is a much more flexible plastic. As a result the sandwich and fold methods are much more difficult to achieve. Large completely flat shapes may droop and require additional support (such as wings) but curved shapes hold better. Consider adding curves or large base support to create more stability. 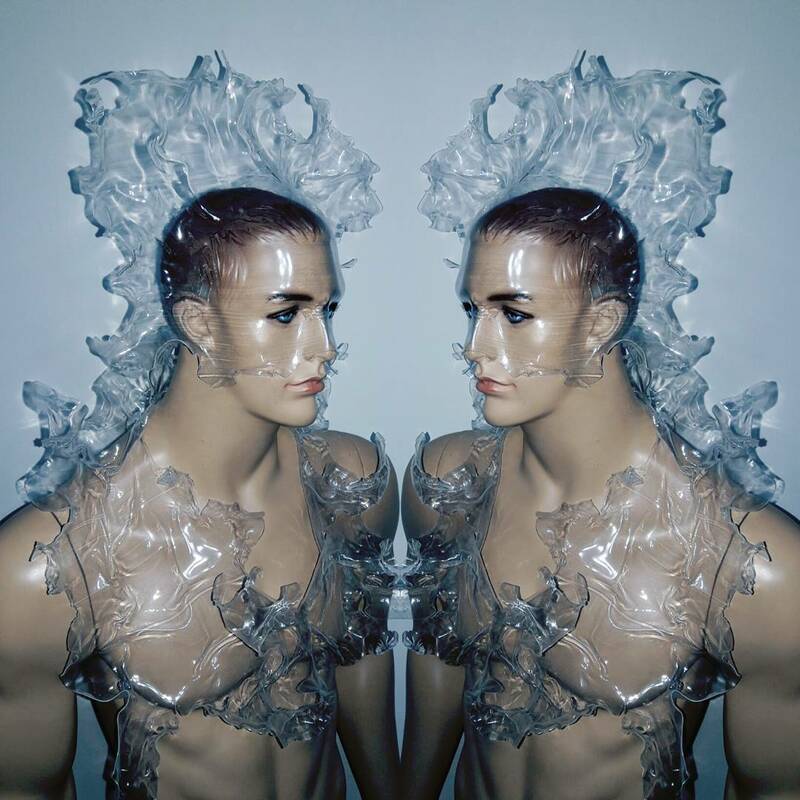 This ‘splash’ wearable art was created by Abrahamd Levy. Note that the large base allows the TranspArt to hold its shape against gravity. TranspArt can be dyed with polyester dyes such as iDye poly, painted with spray paints and spray tints, colored with alcohol inks (like sharpies), and painted with glass paints. TranspArt gradient dyed for a pheonix headdress by Gothichamlet of Cowbuttcrunchies. TranspArt does technically self adhere, but the temperature range is so narrow to create a solid join we do not generally suggest relying on TranspArt’s adhesive properties, instead instant glues (such as crazy glue) work well. TranspArt is solvent stable and glues will not fog it. To learn more about TranspArt, click here. We have a wide range of tutorials, in text, pictorial and video form. Take a look at our list here!